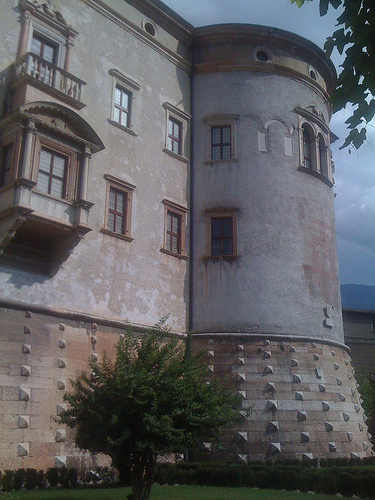 Buonconsiglio Castle (Castello del Buonconsiglio) is a vast monumental complex built between the north and east gates of the ancient city walls (around 1200–1220) of Trent, the capital of Trentino province in Italy. It has three main points: the Castelvecchio, the Magno Palazzo and the Giunta Albertiana. 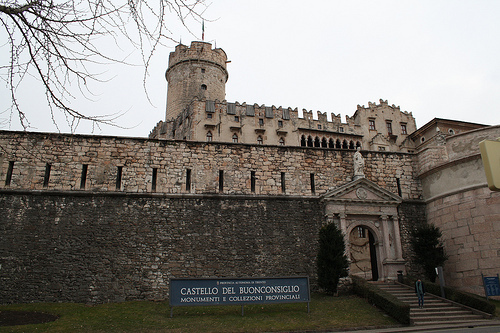 The oldest part, Castelvecchio, was built between 1239 and 1255 around the strong donjon, the Torre d’Augusto, by the Imperial Podestà of Trent, Sodegerio da Tito, who took up office in 1238. Its function was predominantly military. In 1277 it passed to the Church and became the residence of the prince–bishop of Trent. 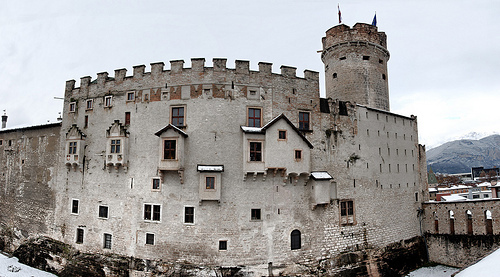 In subsequent centuries a series of modifications and extensions have brought the castle to its present form. Of fundamental importance were the works completed in 1475 by Giovanni Hinderbach with the aid of Venetian craftsmen, who built the Renaissance Gothic internal court with tiered open galleries and the small loggia on the third floor. 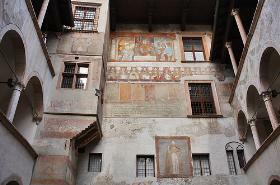 At that time the walls of the upper loggia were frescoed with portraits of the bishops of Trent from the city’s origin to the year 1000; the series was completed in the adjoining room with portraits of the bishops since the millennium. The frescoed festoons (1476) on the outside of the galleries were the work of Bartolomeo Sacchetto of Verona. The appearance of the castle in the 15th century is known from a watercolour by Albrecht Dürer. Between 1528 and 1536 the Castel Nuovo built beside the medieval structure; it was called the Magno Palazzo by Pietro Andrea Mattioli. 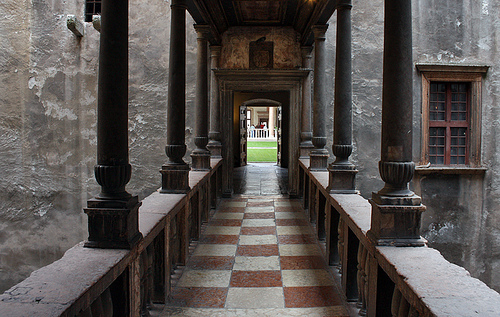 This new residence was built according to the dictates of Renaissance architecture, enriched by extensive decorations based on humanist themes, following the example of other Italian courts. Documents provide the names of a few architects, including Lodovico Zaffran and Alessio Longhi, as well as those of craftsmen who took part in the building of the palace. 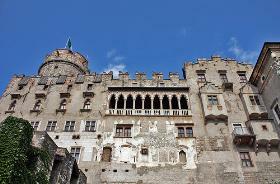 It became a great Renaissance princely residence. 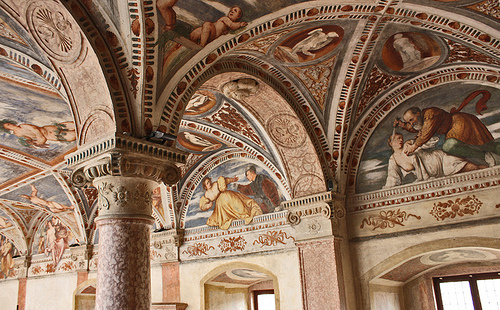 The painters Gerolamo Romanino, Dosso Dossi, Battista Dossi, Marcello Fogolino, Matteo Fogolino and Bartholomäus Dill Riemenschneider worked on the decorations from 1531, creating some of their masterpieces there. Sculptors included Vincenzo Grandi, Alessio Longhi and Zaccaria Zacchi. 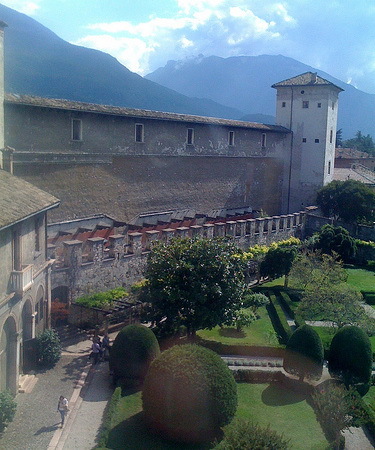 Prince–Bishop Francesco Alberti Poja added the Giunta Albertiana to the Buonconsiglio castle, linking the two preceding structures. Externally it resembles the Magno Palazzo, while the interior is decorated in splendid Baroque style. In the two first-floor salons, frescoed by Giuseppe Alberti, exuberant stucco decoration surrounds historical and allegorical paintings celebrating the victory over the Turks in 1683, while the second floor has richly carved and gilded wooden ceilings. The Torre Aquila is an ancient watch-tower overlooking the east gate of the city. Prince–Bishop Georg von Liechtenstein (1390–1416) turned it into an elegant private residence, accessible from the castle via the path running along the city walls. Around 1400 George had the salon on the middle floor of the tower frescoed with the famous Late Gothic Twelve Months cycle. 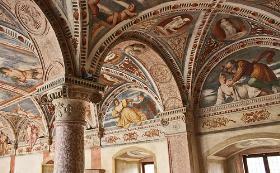 There are other frescoes on secular themes in the Torre del Falco, with scenes of hunting and outdoor life (1530–1532) that are attributable to Bartholomäus Dill Riemenschneider. With the Napoleonic Wars the principality was suppressed, and Buonconsiglio Castle entered a period of decline. 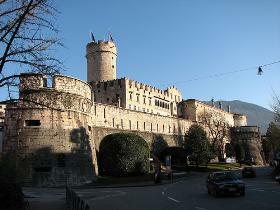 It was occupied in turn by the Austrians, the French and the Bavarians, then converted into a barracks for the Austrians. The Trent Irredentists Cesare Battisti, Damiano Chiesa and Fabio Filzi died there. The Castello del Buonconsiglio later became the seat of the Museo Nazionale and the Museo Trentino del Risorgimento e della Lotta per la Libertà. 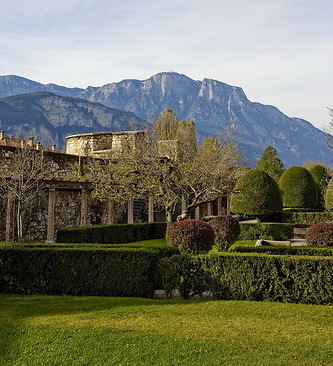 In 1973 it came under the control of the autonomous province of Trento, and in 1975 it became theMuseo Provinciale d’Arte. At the same time important restoration work began, together with the reorganization of the collections. The Buonconsiglio museum has been very active in conservation, cataloguing and restoration, as well as in producing exhibitions and publications.